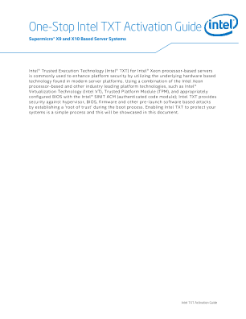 Intel® Trusted Execution Technology (Intel® TXT) for Intel® Xeon® processor-based servers is commonly used to enhance platform security by utilizing the underlying hardware-based technology found in modern server platforms. Using a combination of the Intel Xeon processor-based and other industry-leading platform technologies, such as Intel® Virtualization Technology (Intel® VT), trusted platform ...module (TPM), and appropriately configured BIOS with the authenticated code module; Intel TXT provides security against hypervisor, BIOS, firmware, and other pre-launch software-based attacks by establishing a “root of trust” during the boot process. Enabling Intel TXT to protect your systems is a simple process and this will be showcased in this document. Learn how Intel brings together ISVs, OEMs, and ecosystem partners to help communication service providers deliver next gen.